I met Stephen while walking through Herald Square on an unseasonably warm Friday afternoon. 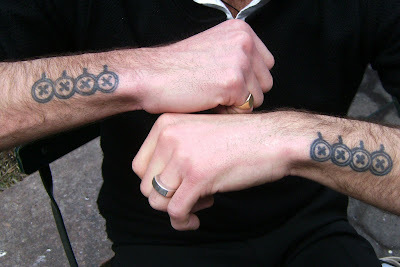 He had his sleeves rolled up and I noticed the set of circles on the outside of his right forearm. He was more than happy to share the story behind them. Stephen was raised in New Jersey and he remembers his father commuting daily into Manhattan, where he was a Vice President at AT & T. His father was extremely dapper, and always wore a "crisp" suit to work, dressing impeccably for the job. He vividly recalls his father taking him for his first suit, and how his father imparted all of his knowledge onto Stephen; how the suit was the uniform of a true gentleman, and all about the cut, the style, the fabric, etc. When Stephen decided to get his first tattoo, he wanted to pay tribute to his father and wanted something above and beyond a normal tribute tattoo. Seen together, and knowing his background, it is all the more apparent that Stephen has tattoos representing two sets of buttons on the suit sleeves of childhood memories. When I asked him what his father thought when he saw this tribute, he replied, "He wasn't super pumped about it, but it grew on him. The first thing he said after I explained it to him was, 'Couldn't you've just gotten DAD tattooed...?' ." 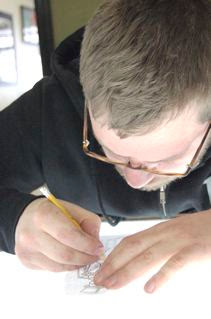 Stephen now has 10 tattoos, most of which were inked at Electric Lotus Tattoo and Piercing in Boonton, New Jersey. His friend Don Perdue was the artist responsible for these honorary buttons. Thanks to Stephen for sharing these cool tattoos honoring his father! Mary-Lee appeared in my doorway at the end of the work day with Anthony standing next to her. 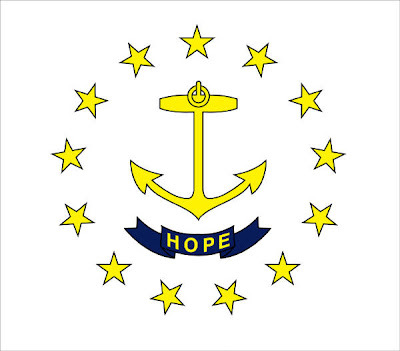 Mary-Lee's tattoo was featured here in December. I had never met Anthony before, but Mary-Lee had mentioned his tattoo to me, and she had told him about Tattoosday. He works for one of the vendors our company utilizes for a mailing process. Anthony, whose birth name is Antonio, is a second generation Italian-American, and the son of Antonio, Sr. He is 100% Sicilian, and last year, on July 29, experienced the joy of having a first child, a son, also named Antonio. Aside from memorial tattoos, ink honoring one's offspring is equal to, or possibly greater, in popularity. As a parent myself, I'm partial to tattoos that pay tribute to one's kids. Both of my tattoos were inked in honor of my daughters, so parental tattoos have a special place in my heart. 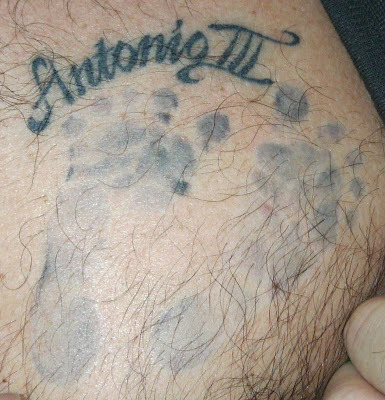 To so honor little Anthony III, Anthony Jr. inked his son's birth name over his heart and, just below it, had his baby footprints added. He wears with honor the legacy of his father's name, and bears the mark of tradition, as it carries from generation to generation. A footprint isn't generally a "permanent" fixture, and fades with time. Although the tattoo is permanent, the lighter ink lends more authenticity to the temporary nature of this snapshot in little Anthony's first moments in the world. It captures the moment of his birth, a pinnacle of joy in every father's life. For a comparison, and I pass no judgment here, check out this earlier footprint post. 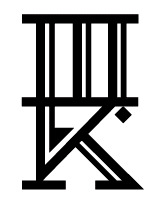 There's a stark difference in the two tattoos, and I will say that this example is a nicer representation of the style of tattoo. This is Anthony's third tattoo, but clearly the most important one. 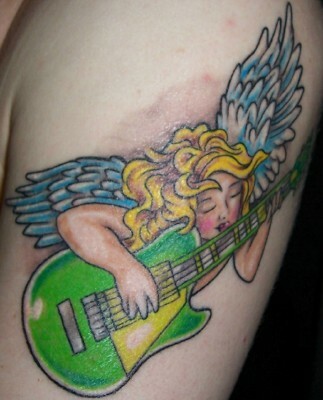 He had this inked at Tattoo Lou's in Selden, New York. Work from one of Tattoo Lou's other locations has appeared previously here. Thanks to Anthony for sharing his meaningful tribute to his son, and his family tradition, here on Tattoosday! Despite some miraculous google algorithm that has doubled my traffic in the last week, regular readers may have noticed we have been light on content, in this shortest of the winter months. And so it goes. I can only blog about what I see (generally speaking), and the ink has been a-hidin'. But fret not, a calendar informed me that Spring is less than a month away, and April (just you wait) will have these pages overflowing with a cross-blog project that will certainly entertain and educate. 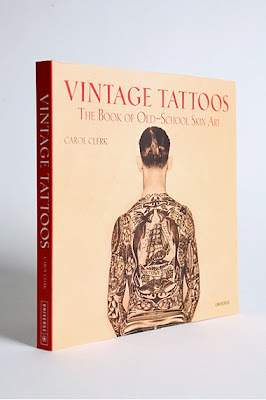 High Voltage Tattoo by Kat Von D.
Vintage Tattoos: The Book of Old-School Skin Art by Carol Clerk. 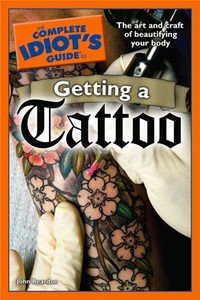 The Complete Idiot's Guide to Getting a Tattoo by John Reardon. 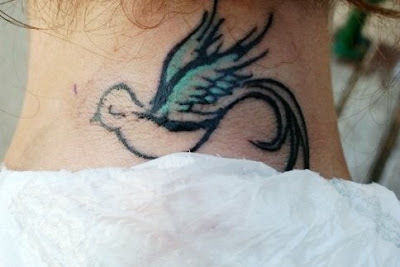 Jenna wrote: "I just stumbled across your blog one day and I'm always up for sharing my favourite tat! 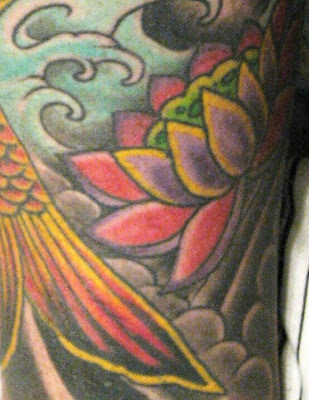 Here's a picture right after it was finished... only picture I've got :( Looks much nicer now that it's finally healed!". Fresh ink isn't always the prettiest, but we here at Tattoosday like the occasional unsolicited submission, especially when we've been in such significant ink withdrawal. "...My best friend passed away from cancer in December 2007, and I was really, really torn up about it. When my friend, Corey (who was only 17) was alive, he would see a psychic and never shared any information with her. One day out of the blue last year, the psychic called Corey's family and spoke to his sister. All the psychic said was 'Do you have a friend named Jenna?' and the sister said 'Yes, she was really close to Corey as well". After speaking for a little while, the psychic declared that Corey wanted me to know that he is always going to be there for me and if I feel anything warm on the back of my neck, that's him guiding me in the right way... So, that's why this beautiful bird is on the back of my neck. For Corey." Thanks to Jenna for sharing this emotional piece with us. We'll update the post with a cleaner, fresher photo when she gets one for us. This installment of Tattoorism comes from Sean, a reader who offered up his leg piece for our viewing pleasure. 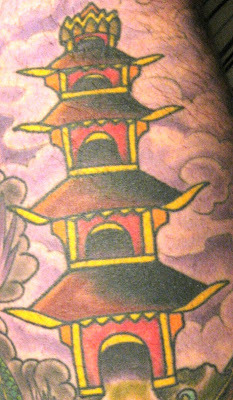 The detail above is my favorite aspect of the tattoo, which wraps around Sean's entire left leg. "...Even though this was done in about 4 or 5 sessions, I could not describe this in any other way except as one big tattoo. Each piece works together with each other. 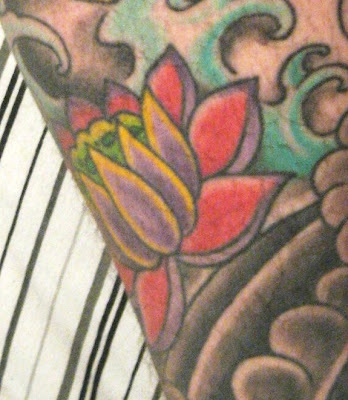 The lotus is another symbol of "growth." I always loved the idea that a lotus begins its life in murky, dark, ugly waters, but eventually grows to become a beautiful flower despite its surroundings. It's a reminder that no matter how hard things get in life, I can make it through those times and blossom as a better person. Sean recognized that our "posts kind of drop off, completely understandably, during the colder months." 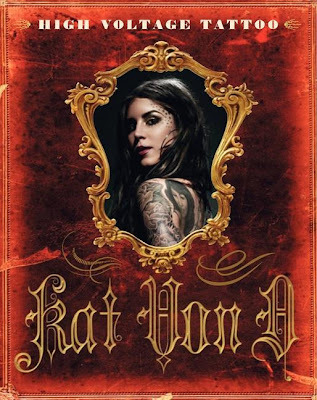 Not only did he help us with content on an ink-less day, regular readers will recognize that I generally don't run sleeves, or wrap-around tattoos, on the blog, as their characteristics make them very difficult to adequately display in their full glory. It's tough to capture them fully when on the street. So a double thanks to Sean for not only sending us an elaborate leg piece, but providing a well-written synopsis of the personal meaning behind the elements in the design! One of the things that I love most about writing Tattoosday is the way New York City plays a significant role in the narrative. It may not be a blog about New York, but it would be a much different one without this city I call my home. This is one of those posts that is tied to the fabric of New York. This evening, I was taking advantage of a free ticket to see a revival of Guys and Dolls at the Nederlander Theater, which is still in preview and opens March 1st. I was standing in line outside, about twenty minutes before curtains. The theater, on the south side of West 41st Street, faces the back of the New Amsterdam Theater to the north. There were assorted people milling about across the street, folks I assumed were crew from Mary Poppins, outside having their last cigarettes before their show started. 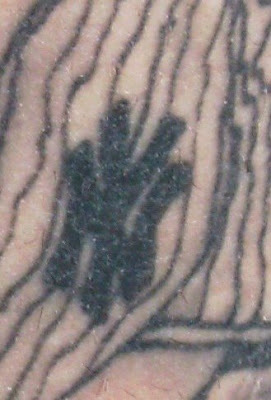 I spotted a woman who had exited the theater and saw, from across the street, that she had a tattoo on her right forearm. I was doing nothing but standing in line anyway, so I crossed over 41st Street to say hello. What's remarkable about this traditional-style anchor tattoo is that she had it done at the same time, on the same spot, and with the same design as her younger brother. For Lizz, this was her most recent, her nineteenth tattoo. For her brother, five years her junior, it was his first. Tattoos in general have significant meaning for their bearers. 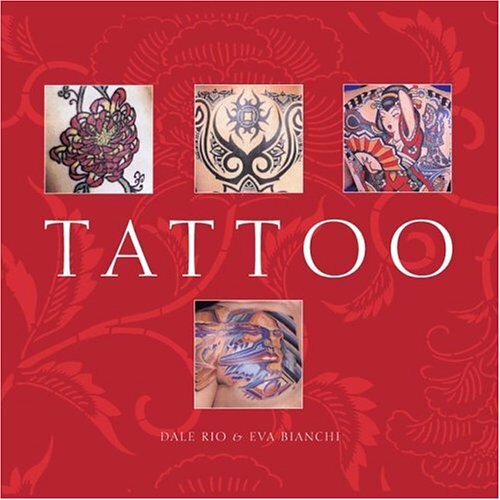 When the same design in shared, and the act of being tattooed is similarly experienced, the emotional charge instilled in the work is compounded. Another example of siblings sharing a tattoo can be seen here. Lizz told me that she doesn't rely on one artist, but that her ink has come from different shops all over the country. 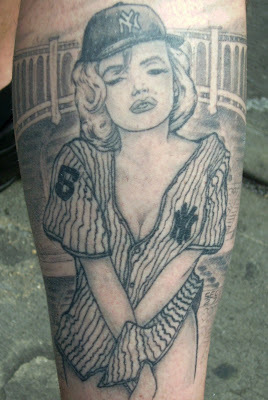 This tattoo was created at Cherry Bomb Tattoo (now known as East River Tattoo)in Brooklyn by the artist Duke Riley. Work from Cherry Bomb has appeared here previously. Thanks so much to Lizz for sharing her ink with us here on Tattoosday! Despite unseasonably warm temperatures this weekend, I didn't see any tattoos, shattering my expectations. However, all was not lost. 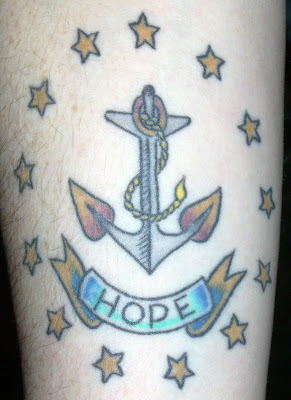 I received a lovely e-mail from a reader named Jenny who brightened my day with an amazing tattoo. She must have been reading my mind when she said, "Since it's winter and most of us have our ink covered by turtlenecks and wool sweaters, I would let one of my tattoos out and share it with you." "My grandmother and mother are two very special people in my life, and both have passed away. When I was 21, I got my first tattoo. It was a small piece, but it meant a lot to me. My mom was so excited for me - she told me that she wished that she had the money to get a tattoo herself! My mom died without ever getting a tattoo, but blue was her favorite color. My grandmother passed away a few years after my mom, and I decided that I would get a tattoo for them. The tattoo did not start out as planned. I went in to the shop thinking that I'd get myself a small lilac on one shoulder that had a green ribbon wrapped around it (Grandma in the Green House had lilac trees). I was also toying around with the idea of some sort of blue tattoo for my mom, but I had no idea what to do. 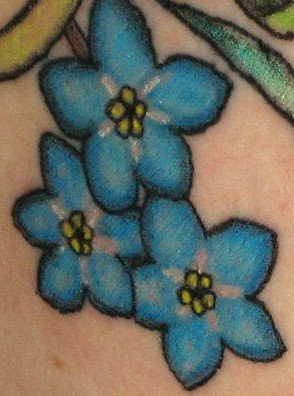 When I talked to the tattoo artist, she was designing a lovely lilac tattoo, and I asked her to put some Forget-me-nots with it for my mom. She created two separate sprigs, and the forget-me-nots were perfect. 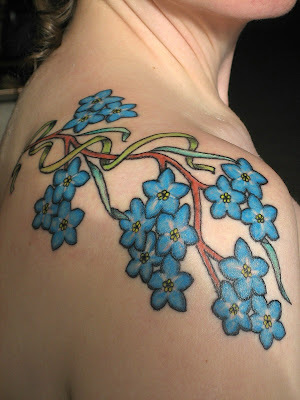 I went in to plan for a lilac tattoo, but I left with a shoulder of forget me nots (my largest tattoo, and I had it done in one sitting - it was intense, but I am so glad that I did it in one sitting). A sprig of lilacs will go on the left shoulder once I have some more money and the design is "right" (it's good but not ready, yet). 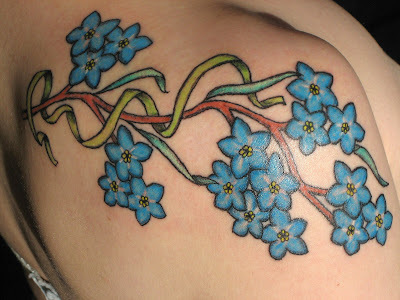 For now, I have my mother's forget-me-nots intertwined with my grandma's green ribbon." This simple and poignant memorial tattoo was inked by Kira at Sleepy Hollow Studios in Potsdam, New York (40 minutes from the Canadian border). Much thanks to Jenny for being a loyal reader and from infusing a drab weekend with color by visiting us here at Tattoosday and sharing her tattoo! As this blog has evolved from a weekly installment over at BillyBlog into a full-time appreciation of the Tattoo, I have gained an immense appreciation of the way Mexican folk art has been absorbed into the medium. 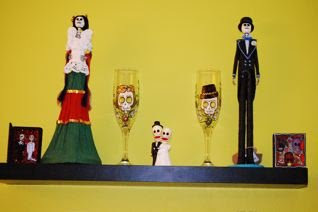 The celebration of Dio de los Muertos (the Day of the Dead) is a perfect match for tattooing, as it is associated with bright colors and what I call a "pleasant morbidity," in the form of skeletons and skulls. 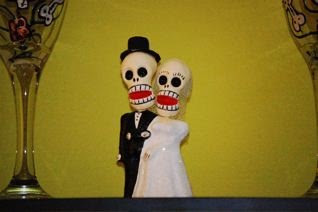 Some of my favorite posts here at Tattoosday have been related to the Day of the Dead (see here and here). So it was with great pleasure that I learned that Carrie, of the amazing ship tattoo, was sending me new ink photos, and moreso when I saw they were in the Dio de los Muertos theme. Carrie sent a slew of photos relating to two tattoos she and her new husband, Ryan, received as a wedding gift from their friend, Evan Lindemann, who is a tattoo artist at Revolver Tattoo in New Brunswick, NJ. This is the same shop where her pirate ship was (and continues to be) inked. For our wedding gift, ...Evan...wanted to give us a tattoo each. So, we have a piece together and they are beautiful!" Carrie concludes, that these tattoos "symbolize our love, marriage and honeymoon". She added that this may "sound kind of corny," but she is right when she says they are beautiful. A belated congratulations to Carrie (and Ryan) for the marriage, and their incredibly cool (and romantic) his-and-hers tattoos. In a day and age when so many married couples tattoo each others' names on their bodies, it is heart-warming from an artistic perspective to see the level of creativity and thought that went into these pieces. 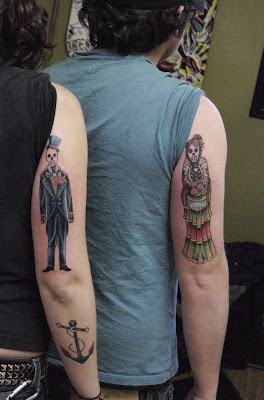 And a hearty thank you to Carrie (and Ryan) for sharing their work here on Tattoosday! I met Amanda in my neighborhood a couple of weeks ago on a cold day in January. She wasn't wearing gloves which, despite the cold, was a good thing, as her hands bore a couple of nifty tattoos that really flashed in the sunlight. Unfortunately for me, I was bogged down with a bag of groceries and dry cleaning, so I wasn't in any position to take pictures. I did manage to chat with Amanda briefly, and I told her about Tattoosday. I passed her my card and asked her to email me if she was interested in sharing. Amanda hails from Kansas City, Missouri, and moved to New York several years back to pursue her dream of an artistic career. She estimates that her body is 30% inked, most of which was done by her home town artist Steve Drew, who works out of a shop called Irezumi Body Art. 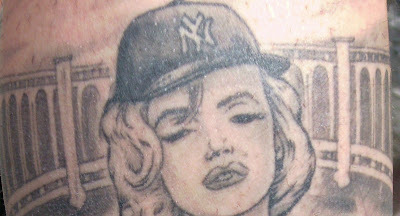 She was looking around for an artist in New York, when she accompanied a friend to Red Rocket Tattoo in Manhattan. There, Mike Bellamy was working with her friend on a concept sleeve. Amanda liked what she saw and started working with Mr. Bellamy on her hand guns. You can see other Tattoosday-featured work by Mike Bellamy here. So, why put guns on your hands, of all places? Amanda says it was an aesthetic decision, and not any sort of moral or political statement. Nor, she says, was it necessarily a nod to her roots in Kansas City. 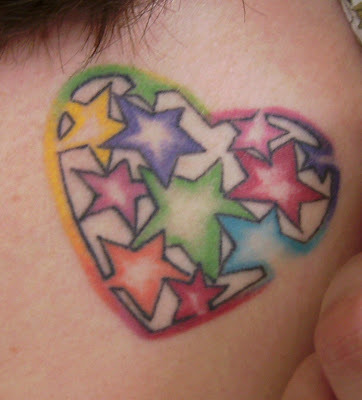 Rather, Amanda wanted a whimsical tattoo that anchored what will become, eventually, full sleeves. 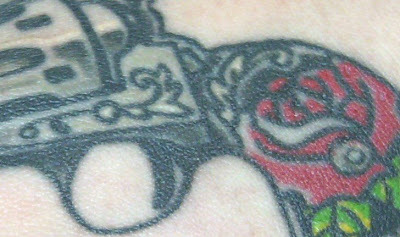 The old six-shooter style of revolver is a traditional tattoo, in some senses (see previous gun-themed tattoos here). But Amanda wanted her hand guns to be colorful and depict a feminine side, reminiscent of a weapon tucked into a saloon-girl's garter belt. The red roses, set into the handles, give the guns a softer edge. Their placement on the hands recall a childlike innocence, reminding one of the gesture kids make when they pretend their hands are toy guns. Amanda said that she had these inked in one sitting, each gun taking about an hour and a half each. Mike Bellamy inked the outline on each hand first, then went back and did the color and shading on both. How did it feel? "The most intense pain I've ever felt," said Amanda, "especially on the knuckles". Thanks to Amanda for sharing her guns here on Tattoosday! We look forward to seeing more of your ink in the future!